If you have a tooth which has been severely damaged by decay or other problems, you have several dental options to repair it. You can opt for fillings or crowns to repair or cover the tooth; these techniques are very effective and relatively easy to perform. However, you have another option as well. Inlays and onlays are dental techniques which give you great results in covering problem tooth areas, but allow you to keep more of your original tooth intact than crowns or fillings. Dental inlays are composed of porcelain, gold, or a composite resin. They are custom-made to fit inside the cusp of a damaged tooth. Inlays cover the portion of the damaged tooth which is visible and prevent any further decay from entering the cavity. Dental inlays are very appropriate for treatment of minor molar cavities. Because the molars have a cusped surface, plaque can easily lodge in the crevices on the top of the tooth and cause cavities, which allow harmful bacteria to penetrate the root of the tooth. Once inside the molar, this bacteria causes great damage to the tooth’s root and can eventually result in loss of the molar. Inlays halt this process and prevent further decay by covering the cavity. They are also much more attractive than regular fillings, as they can be blended to match the shade of the tooth exactly, giving you a more natural appearance. Inlays are more appropriate for small, isolated cavities; for areas which have been damaged extensively and involve more than one part of the tooth, onlays may be more appropriate. Dental onlays are similar to inlays but cover more extensive areas of the tooth, often the entire top portion. Onlays are also custom-fitted to match the exact contours of the tooth’s surface, and are placed and filed so that they blend with the rest of the tooth exactly. Like inlays, onlays are attractive in appearance and virtually undetectable in the mouth. Both onlays and inlays require two dental visits. In the first visit, the old filling is removed or the decayed area cleaned, and measurements are taken for the production of the custom-fitted inlay or onlay. On the second visit, the inlay or onlay is attached, shaped and polished. Our West Hollywood dentist can devise a treatment solution for your cavity problems which includes inlays and onlays if appropriate. The use of these techniques can help many patients achieve good dental health and maintain an attractive appearance. 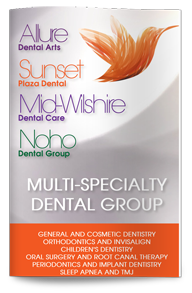 For patients that need the leading cosmetic dentist in West Hollywood, Dr. Poneh Ghasri is only a phone call away for all your dental needs.